Can provide you and your firm with design support, training or technical expertise. With a diverse and varied background Robert can and does provide clients with these services. In the are of training he has trained numerous users on SketchUp, AutoCAD, and now almost exclusively on Vectorworks Landmark. Design support comes in the form of leveraging the power of Site Information Modeling and 3D design tools built into Vectorworks Landmark as well as providing Technical Support in the form of creating standards or detailing of construction documents. While at LandDesign Robert and his team developed strategies and techniques to ensure that a diverse project team could come into the project and gain the knowledge that other studios had learned during the developments life span. The Landscape Architecture Bureau had a long history yet hadn't developed a comprehensive standard for the office. 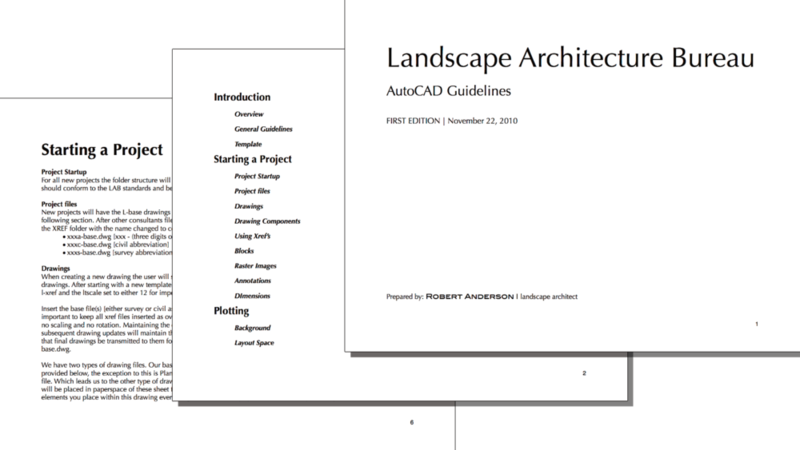 Robert developed a AutoCAD Guideline, based loosely on National CADD Standards and his previous experience, which later transformed into Vectorworks Standards for the office. With the assistance of previous training from Vectorworks, Robert developed an intensive two day session for Town & Gardens in NYC for new and existing staff to get up to speed and learn more valuable parametric tools and features in Vectorworks Landmark.